Narellan is a suburb of Sydney, New South Wales. Narellan is located 60 kilometres south-west of the Sydney central business district, in the local government area of Camden Council and is part of the Macarthur region. Narellan is known for its modern shopping centre, Narellan Town Centre, historic St Thomas Chapel, Studley Park House and golf course. 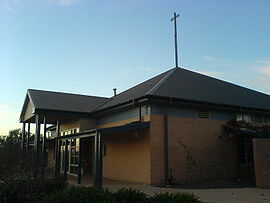 The area now known as Narellan was probably originally home to the Tharawal people, based in the Illawarra region, although the Western Sydney-based Darug people and the Southern Highlands-based Gandangara people were also known to have inhabited the greater Camden area. Very early relations with British settlers were cordial but as farmers started clearing and fencing the land affecting food resources in the area, clashes between the groups arose until 1816 when a number of indigenous people were massacred and the remainder retreated from direct conflict with the settlers. In 1805 wool pioneer John Macarthur was granted 5,000 acres (20 km²) at Cowpastures (now Camden). After the land was cleared, it was used for farming for most of the next 200 years until Sydney's suburban sprawl reached the town of Camden and modern suburbs like Narellan were subdivided into housing blocks. Narellan Post Office opened on 1 August 1856. Narellan was home to the Oran Park Raceway motor racing circuit, which has been redeveloped into a new residential suburb known as Oran Park Town. Camden Golf Club is the only golf club in Narellan. Narellan also has a football club known as Narellan Rangers located at . In the 2016 Australian Bureau of Statistics Census, the suburb of Narellan had a population of 3,616 people. Like its neighbouring suburbs, Narellan is predominantly Australian born (84.5%) families with young children (48%) living in detached houses (90.2%). The number of people aged 65 and over (11.2%) is substantially less than the national average (14%). Narellan lies in the central ward of Camden Council, currently represented by Fred Anderson, Rob Elliott and Debby Dewbery. It sits within the state electorate of Camden, represented by Labor's Geoff Corrigan, the former Mayor of Camden, and the federal electorate of Hume. ^ Australian Bureau of Statistics (27 June 2017). "Narellan (State Suburb)". 2016 Census QuickStats. Retrieved 19 March 2018. ^ "The History of Camden". Camden Historical Society. Archived from the original on 3 April 2007. Retrieved 14 June 2007. ^ "Studley Park". New South Wales State Heritage Register. Office of Environment and Heritage. H00389. Retrieved 18 May 2018. ^ "Camelot". New South Wales State Heritage Register. Office of Environment and Heritage. H00385. Retrieved 18 May 2018. ^ "Kirkham Stables and Precinct". New South Wales State Heritage Register. Office of Environment and Heritage. H01411. Retrieved 18 May 2018. ^ "Oran Park Town". Retrieved 19 January 2015. ^ "Camden Golf Club". Retrieved 19 January 2015. ^ "Narellan Rangers Grounds". Retrieved 19 January 2015.